Update: The Meerkat platform has recently changed their live streaming focus. All the information on this article is still accurate for Periscope. What are Periscope and Meerkat? First thing first, let’s explain what Periscope or Meerkat are for those of you not in the know. Periscope and Meerkat are very similar programs meant to accomplish essentially the same thing; in other words they’re competing apps. They both do live streaming or broadcasting over the internet while having live interaction with your audience. Why is this important? Imagine watching a TV show and having the ability to interact with the host, to ask questions and get immediate answers. That’s huge for the viewer because the stream becomes an interactive experience and thus far more valuable to them than a traditional broadcast. When you think about YouTube from a viewer’s perspective, if you have any questions or need clarification about the video you’re watching, you have to watch the entire thing. Then, if it wasn’t answered, you’re out of luck. At best, you can leave a comment and hope the creator replies back, but it could take weeks to get an answer if ever. Now imagine you’re giving a live presentation but can immediately adjust it according to your audience’s needs. If everyone wants to know more about a specific subject, you can give that to them. If they need you to repeat something or give clarification, you can. If you’re curious and want to know what your audience is thinking about what you have said so far, you can ask them. No more guessing games or wondering if you provided the value your viewers were looking for. It’s instant live feedback. This kind of interactive live broadcasting has never happened before and is the reason why a company like Twitter is willing to spend $100,000,000 dollars for a company (Periscope) that wasn’t even out of beta yet when they bought it. Periscope’s tweet when it announced that it had been purchased by Twitter. Since that’s not what this post is about, we’ll have to address this question in the future. In short, though, they’re competing apps with very minor differences. How Can I Use Periscope and Meerkat to Market My Business? It’s time to get to the nitty-gritty and talk about the different ways you can use these valuable tools to better market your company. Every single company out there is looking to sell something—if not, they would have no way to make a profit. Whether you sell a physical product or a service, try to teach your customers about it.Not only will you established yourself as an expert in your field, but showing potential customers a demonstration of your product drastically increases your chances of a sale. If you sell Mexican food (I love Mexican food), teach them how you make guacamole. I guarantee their mouths will water, and it will probably make them come in and order an entree. At the very least, the next time they think about guacamole, they will think of your restaurant. If you sell a gadget of some sort, teach people how to use that item and answer their questions. Get them excited about it. Show them how cool it is so they want to buy it and tell others about it. Maybe some of them already own your product but don’t know all of its features, so teach them how to use it. If you provide a service, you can teach some basics and use that as a hook to get people to hire you for the full service. For example, if you’re a local plumber, you can broadcast how to fix a leak in a sink. If you establish yourself as an authority in your niche, the next time your audience is in need of your services, they will think of you first. Sure there are tons of how-to YouTube videos, but you can’t ask specifics questions or get clarification when you don’t understand. That’s the point of using Periscope and Meerkat. You might be wondering, “What’s the point of doing this?” The reality is that people on Meerkat and Periscope are intrigued by seeing the everyday lives of people—or in this case, companies. People also love to see how things are made or just get an inside look of the companies they do business with. It’s no wonder why there are tons of local news stations across the US already using Meerkat and Periscope to broadcast the behinds-the-scenes of their shows and talking to their viewers during commercial breaks. People love seeing this. Your customers are curious to know what goes on behind the scenes of your company. The more they know about the people they’re doing business with, the more attached they’ll become to your brand. If your customers can start looking at your company as a friend or someone they know on a personal level, it’s more likely they’ll continue to buy your products, thus creating brand loyalty. It’s also possible that your customer will give you second chances when you make mistakes. You know that every company makes mistakes from time to time, and that people generally don’t expect other people to be perfect. Once a customer stops seeing you as a corporation and instead sees you as a friend, this will create an entirely different dynamic between you and the customer. That’s the power of social media. Just remember, social media is meant to be social, so your goal should always be to show the human side of your company. Every company hosts special events throughout the year such as gatherings, outings, and BBQs. The next time you have one, do a live broadcast and see what feedback you get from your customers. Leverage your other social media channels to announce your next broadcast and get your followers to tune in on Periscope or Meerkat. Your company might also host or attend trade shows throughout the year. If this is the case, chances are that a lot of your customers are not be able to attend. Use Periscope or Meerkat to give them the option to still watch you showcase your latest and newest product from the comfort of their home or office. We saw a good example of the use of Meerkat during SXSW 2015 when the app took center stage and was used to broadcast the entire event to the outside world. It gave companies like Mashable the ability to show everyone what was going on during the festival in real time, allowing viewers to feel like attendees. The take away here is to show an exclusive company event to your customers and create a more personal experience with them. Keep in mind that you’ll have live interaction with your audience, which will give you the ability to adjust and show more of what they want to see and less of what they don’t. Doing Q&A’s are always a good choice for many reasons. First and foremost, you get to listen to the questions your customers have and address their problems properly. You also get to find out what they want from your company. If you can take notes and analyze their needs later, you can then create products or services that can be of better help to them. In other words, you get to know exactly what they want you to sell to them next. However, the best part about a Q&A is that it doesn’t really need much preparation. Simply announce your next Q&A session and then listen to your customers. Find out what kind of questions or problems they have and provide the help they need. You’ll be surprised how much you can learn by hosting regularly scheduled Q&A’s. The ROI of showing the culture of your company may be hard to measure, but one thing is for sure: people want to do business with happy people. If you can use Periscope or Meerkat to show all the happy moments within your company, it’s guaranteed to have a positive effect on the overall outlook of your company from your customers’ perspective. Let’s face it, you probably already do charitable events within your company, so why not use these tools to tell the entire world about it? Do you raise money for any good causes in your company? Broadcast it and show them the type of people you really are. Your customers will appreciate seeing this side of your business. Do you have Nerf Gun Wars on Fridays in your office? How about Bring Your Dog to Work days? Or maybe catered lunches? Any activities like these are worthy of being broadcasted to the world. Showing the happy culture of your company is key to connecting to your existing customers on a more personal level. I can’t say this enough—people want to do business with happy people. Seeing happy people attracts other people and speaks well of your overall company. The important thing to remember is to provide something unique and show a different side of your company. Remember that social media is meant to be social. Don’t turn this experience into an infomercial, but rather provide something more intimate. Show that your company has personality and that there are humans on the other side. Guy Kawasaki once said that a good rule of thumb regarding social media is to always spend 80% of your time providing value and about 20% promoting your brand. This makes a lot of sense because if you continue to help your customers and provide tons of value, they will probably buy your product/service when it comes time to sell to them. Give your customers something they can’t get anywhere else or in any of your other social channels. Take this opportunity to capture their attention, giving them a reason to keep coming back. If you give them content they can get through your other social channels, there will be no incentive for them to follow you and tune in the next time you broadcasting on Periscope or Meerkat. Your livestreams need to be something exclusive to this social channel. Lastly, if you’re unsure which platform is best for your company, try using both Periscope and Meerkat. People always ask which one is better between the two, and my answer is to use both and experiment as much as possible. They’re both free and can potentially expose you to two completely different audiences. You have nothing to lose by giving each of them a try. Experiment and you’ll find that both apps have their own strengths and weaknesses. Once you get enough experience, you can then make an educated decision and pick just one if you desire. 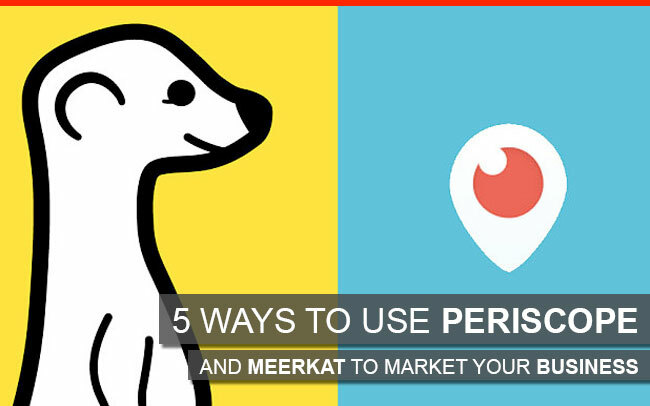 You still need more ideas on how to use Periscope and Meerkat to market your business? Find me on Twitter and Instagram and let me know. I’ll be more than happy to give you unique ideas for your specific industry. Just try me.